» How Does Self-hypnosis Help You? Hypnosis is a trance-like state which induces a sort of physical lethargy in a person. But this is induced so that an individual is able to achieve greater mental focus and concentration. While such states of hypnosis may be induced through instructions given by a hypnotherapist, another method of achieving this state of subconscious-awareness is by self-administering the instructions. This practice of entering the state of hypnosis on one’s own is called self-hypnosis. The English word ‘hypnotism’ was first brought into parlance by Scottish physician and surgeon called James Braid in the year 1841. Thereafter, he tried out self-hypnotism in 1843 on himself, while in the presence of some friends. The time and place is up to you, so you can practice at your convenience. It is a much less complex procedure and can effectively be used by individuals to deal with different problems. What can you tackle using self-hypnosis? Changing perspective to eliminate negativity. Basically self-hypnosis helps to tackle these problems by getting you to relax first your body and then your mind. When your mind is relaxed, your conscious mind is slowly tuned out and the sub-conscious gains focus. With the subconscious focused and connected with the conscious, you can effectively reach the root of any problem and work towards correcting it. The first one is Motivation: Unless you have a good enough reason or crisis motivating you, you will most likely find it extremely difficult to practice self-hypnosis. The second step is Relaxation: Unless you are relaxed your mind will refuse to switch over from conscious to sub-conscious. The third step is Concentration: When you concentrate and make your mind focus on anything specific, especially images, it creates mental energy essential for self-hypnosis. The fourth and final ingredient is Directing: This is necessary when you have certain very specific needs or goals in mind. This is because in the state of self-hypnosis you will need to direct your mind to visualize the goal you want to achieve. 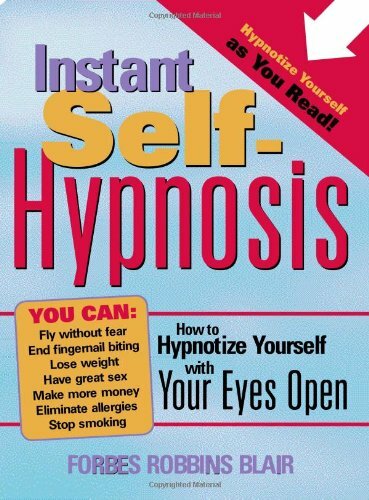 And for more help on practicing self-hypnosis, here’s a very good book – Instant Self-Hypnosis: How to Hypnotize Yourself with Your Eyes Open [Paperback], written by an avid practitioner. It is believed to contain fool-proof tips and is an extremely easy read. According to satisfied customers, the methods in this book really work, and as long as you stay motivated and determined, they are bound to work for you as well! So give self-hypnosis a shot, and prepare to get the benefits! Previous Post How To Improve Your Self Esteem With Self Hypnosis! Next Post Self Hypnosis To Enhance Your Performance In Sports! !